Objectives: Allergic rhinitis (AR) is an inflammatory disorder induced by immunoglobulin E-mediated response after allergen exposure. It is the most common allergic disorder with a high burden on patients and society. The purpose of this study is to report the prevalence and severity of AR and its complications among the population of Al-Ahssa in the Eastern Province of Saudi Arabia. Materials and Methods: This study analyzed observational, descriptive, cross-sectional data. Our sample includes males and females from all age groups from Al-Ahssa, Saudi Arabia, in October 2017. Our sample size was 807 with a confidence level of 95% and a confidence interval of 3.45. Results: The study suggested that 48% of the samples were diagnosed with AR, 28% had symptoms suggestive of AR, and 24% did not have any symptoms. Results suggest a great association between AR, eczema, and asthma. About 53% of patients who live near a farm were diagnosed with AR and 28% of them had symptoms. This indicates an association between living near a farm and AR. In addition, there was a clear relationship between owning a pet and AR. In 44% of cases, recurrence occurred in winter. Eighty-one percent of patients either with AR or who have symptoms of AR are triggered when exposed to a certain stimulus. Sixty-four percent reported that symptoms are provoked by dust. The most common symptoms reported were nasal itching followed by sneezing. Fifty-seven percent of patients who have AR or symptoms of AR have severe disease. Seventy-five percent of them complain of sleep disturbance. Twenty-seven percent of patients reported 0 effect on life, 14% scored 5, and 14% scored 10 on the daily activity scale. Conclusion: We concluded that 76% of the samples were either diagnosed with AR or have symptoms suggestive of AR. These symptoms are mainly triggered by dust and are associated with living near farms. Therefore, we designed this study to assess the prevalence and severity of AR and its complications among the population of Al-Ahssa in the Eastern Province of Saudi Arabia. This study analyzed observational, descriptive, cross-sectional data. Our sample included males and females from all age groups from Al-Ahssa, Saudi Arabia, in October 2017. Our sample size was 807 with a confidence level of 95% and a margin of error of 3.45%. We collected our data through an electronic questionnaire, which was distributed randomly among the population, using the simple random sampling method. In the questionnaire, the age groups were divided within intervals of 5 years, below 15 years, and older than 55 years to demonstrate the prevalence of AR among different age groups. In addition, gender and residence were taken into consideration. We asked whether a specialist diagnosed the sample with AR or not. In addition, symptoms suggestive of AR were asked to determine patients who may have AR. Recurrence of symptoms and triggers were also explored. In addition, patients were asked whether they were diagnosed by a physician in the past with asthma and/or eczema. In addition, to classify according to the ARIA classification system, the questionnaire included the period of symptoms and their severity. Finally, a scale was given to the patients to assess the effect on life. It composed of a scale from 0 to 10, 0 being no effect on life and 10 being most effect of life. The data were all analyzed using the IBM statistics SPSS version 22 (IBM Corp., Armonk, NY, USA). The crosstabs analysis was carried out based on the data collected that demonstrated the relationship of AR and other factors. In addition, other data such as age, gender, and residence were analyzed using frequency tables. Ethical clearance was taken from the Ethical Committee of the College of Medicine, King Faisal University. All participants' information was treated with confidentiality. Participants' consent was taken at the beginning of the questionnaire. The study sample consisted of 78.2% females and 21.8% males. Most individuals included in this study were from the age group of 21–25 years (21.3%). On the other hand, the least participants were either under 15 or above 55 (2.7% or 3.8%, respectively). According to nationality, 99.3% of the samples were Saudi and. 0.7% were of other nationalities. The study suggested that 48% of the samples were diagnosed with AR, 28% had symptoms suggestive of AR, and 24% did not have any symptoms. Cross tabulation of each group with several factors was done to find the factors that influence AR. According to male patients, 47% were diagnosed with AR and 29% experienced symptoms of AR. On the other hand, 48% and 27.5% of females were diagnosed and had symptoms of AR, respectively. The prevalence of AR, symptoms of AR, and having no symptoms within each age group is shown in [Figure 1]. Association with asthma and/or eczema showed 22% prevalence in patients diagnosed with AR, 15% in patients with symptoms suggestive of AR, and 12% prevalence in patients without any symptoms. About 19% of patients with AR, 11% of patients with AR symptoms, and 16% of patients with no symptoms had chronic diseases, which varied and showed no correlation with AR. In addition, 6% of patients with AR and 5% of patients with symptoms of AR are smokers. Moreover, 8% with AR and 11% with AR symptoms are passive smokers. On the other hand, 3% of patients with no symptoms are smokers while 7% of them are passive smokers. In addition, 46% of patients who have AR and 45% of patients with symptoms suggestive of AR had a consanguinity marriage. There was also no association between hours of sleep and the disease as a mean of 76% of the population sleeps <6 h, regardless of AR. Residence in either a city or a town had no effect on the development of the disease. 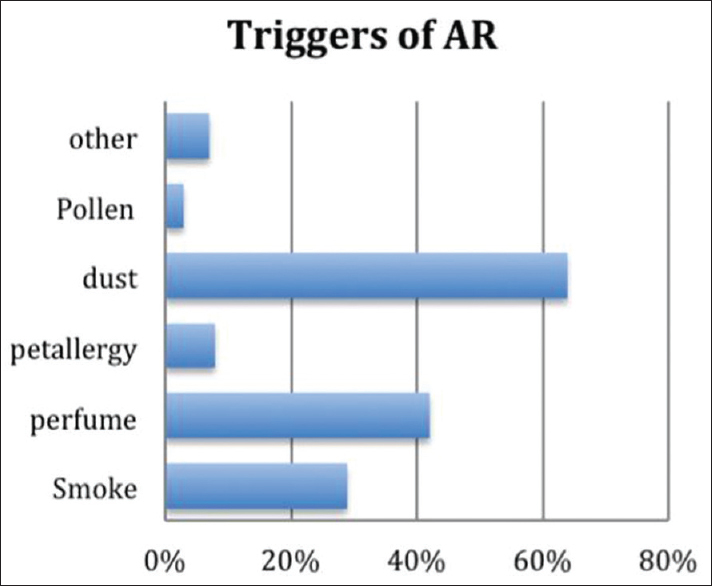 In contrast, 53% of patients who live near a farm were diagnosed with AR and 28% of them had symptoms. In addition, 18% of patients had pets while 82% did not have pets. The prevalence of AR or its symptoms in pet owners was 73%. On the other hand, the prevalence of AR or its symptoms in patients who do not own pets was 85%. In 44% of cases, recurrence occurred in winter, followed by summer (41%), fall (11%), and spring (4%). Statistical analysis showed that 81% of patients either with AR or who have symptoms of AR are triggered when exposed to a certain stimulus. About 64% reported that symptoms are provoked by dust and 42% reported perfumes as their trigger [Figure 2]. The most common symptoms reported were nasal itching followed by sneezing, nasal block, nasal discharge, eye itching and epiphora, and hyposomnia. Moreover, the most common discharge consistency and color were watery (39%) followed by white discharge (31%). Fifty-seven percent of patients who have AR or symptoms of AR have severe disease. Seventy-five percent of the individuals who have severe disease complain of sleep disturbance, 47% have disturbance in daily activities, and 24% have decreased work or school performance. Daily activity scale to assess the effect on life has been given to the patients. Eighty-five percent of the patients reported back. Twenty-two percent of patients reported 0 effect on life, 13% scored 5, and 16% scored 10 on the daily activity scale. The rest 49% of the participants were distributed between the other values as seen in [Figure 3]. AR has a high prevalence throughout the world, with a prevalence rate of 45%, and this represents a global health issue. Regardless of the high prevalence rate, a high number of patients remain undiagnosed. In a study done in Western Europe, it was found that an estimate of 45% of their participants were undiagnosed. In our current study, 28% of participants were undiagnosed with positive symptoms suggestive of AR. Detecting AR is of importance because of its subsequent complication and its effect on quality of life and productivity in school or work. In our current study, the assessment of the daily effect of the disease was done using a scale of 0–10, which showed that 57% of the participants have a score between 5 and 10, which suggests a severe disease. The prevalence of atopy worldwide has been increasing over the years. A study done in Southwest London showed an increase in the prevalence of allergen skin test reactivity. In Saudi Arabia, several epidemiological studies have proven an increase in the prevalence of AR. A study done in different regions of Saudi Arabia concluded that 34% of its participants were positive for AR. Another study determined the prevalence of AR disease in children in different cities of Saudi Arabia. They found that the highest prevalence was in Al-Ahssa (48.2%) compared with Riyadh (29%) and Jeddah (24.3%). This has been contributed to various factors that all correlate to the rapidly changing environment of Saudi Arabia. In a study done in Riyadh, it concluded that many plants contain pollens that are allergic in nature. This strongly associates with our findings that establish a relationship between living near farms and developing AR. Several triggers have been known to increase AR attacks. In Saudi Arabia, an increase in exposure to environmental factors particularly smoke and pets has contributed to the development of AR. In addition, a study done in Riyadh suggested that sandstorm dust is a source of potential triggers of allergic substances. In our study, we have found that the majority of cases were provoked by dust, followed by perfumes, smoke, and pets. Most pets owned were found to be birds and cats. A study done in Saudi Arabia concluded that cat dander contributed to inhalant allergens. Moreover, smoking and air pollution damage the respiratory epithelial cells and therefore predispose to AR and asthma. In our study, we have found that 30% of patients who were diagnosed with AR or who have symptoms suggestive of AR were either smokers or passive smokers. This may not show a clear association between smoking and AR. However, it may be due to the fact that the percentage of women who smoke in Saudi Arabia is low due to religious or cultural factors or due to the fact that it is socially unacceptable., The association between bronchial asthma, eczema, and AR has been well known and has been proven in several studies. In our study, 37% of patients with AR had eczema, asthma, or both. Therefore, an association between AR, eczema, and asthma was indicated. The above study also concluded an association between consanguinity and allergic disease. Our study concluded that about half of patients with AR had parents of a consanguinity relationship. AR is a common disease in the community, which prevalence has been increasing over the years. We concluded that 76% of the participants were either diagnosed with AR or have symptoms suggestive of AR. These symptoms are mainly triggered by dust and are associated with living near farms. In addition, recognition and diagnosis of the disease could lead to early management and improvement in the overall quality of life. We would like to show our sincere gratitude to our colleagues, Sara Alomair, Rehab Almotairi, and Ghofran Essa Mohammed Alsuliman, for their effort in data collection. Sobki SH, Zakzouk SM. Point prevalence of allergic rhinitis among Saudi children. Rhinology 2004;42:137-40. Sibbald B, Rink E, D'Souza M. Is the prevalence of atopy increasing? Br J Gen Pract 1990;40:338-40. Bauchau V, Durham SR. Prevalence and rate of diagnosis of allergic rhinitis in Europe. Eur Respir J 2004;24:758-64. Ryan D, van Weel C, Bousquet J, Toskala E, Ahlstedt S, Palkonen S, et al. Primary care: The cornerstone of diagnosis of allergic rhinitis. Allergy 2008;63:981-9. Nihlén U, Greiff L, Montnémery P, Löfdahl CG, Johannisson A, Persson C, et al. Incidence and remission of self-reported allergic rhinitis symptoms in adults. Allergy 2006;61:1299-304. Crystal-Peters J, Crown WH, Goetzel RZ, Schutt DC. The cost of productivity losses associated with allergic rhinitis. Am J Manag Care 2000;6:373-8. Greiner AN, Hellings PW, Rotiroti G, Scadding GK. Allergic rhinitis. Lancet 2011;378:2112-22. Skoner DP. Allergic rhinitis: Definition, epidemiology, pathophysiology, detection, and diagnosis. J Allergy Clin Immunol 2001;108:S2-8. Seidman MD, Gurgel RK, Lin SY, Schwartz SR, Baroody FM, Bonner JR, et al. Clinical practice guideline: Allergic rhinitis. Otolaryngol Head Neck Surg 2015;152:S1-43. Lee CH, Jang JH, Lee HJ, Kim IT, Chu MJ, Kim CD, et al. Clinical characteristics of allergic rhinitis according to allergic rhinitis and its impact on asthma guidelines. Clin Exp Otorhinolaryngol 2008;1:196-200. Richardson MA, Cummings CW, Harker LA, Schuller DE, Flint PW. Cummings: Otolaryngology, Head and Neck Surgery. 6th ed. Philadelphia: Saunders Elsevier; 2015. Sacre Hazouri JA. Allergic rhinitis. Coexistent diseases and complications. A review and analysis. Rev Alerg Mex 2006;53:9-29. Borres MP. Allergic rhinitis: More than just a stuffy nose. Acta Paediatr 2009;98:1088-92. Al-Frayh AR, Reilly H, Harfi HA, Hasnain SM, Thorogood R, Wilson JD. A 12 month aerobiological survey of pollen in Riyadh. Ann Saudi Med 1989;9:443-7. Alreshidi1 FM, Alrashidi AS, Alshammari FN, Qadi AB, Alrashidi AG, Alghaythi SM, et al. Knowledge, attitude and practice about allergic rhinitis in Saudi Arabia. Egypt J Hosp Med 2017;69:2199-203. Kwaasi AA, Parhar RS, al-Mohanna FA, Harfi HA, Collison KS, al-Sedairy ST, et al. Aeroallergens and viable microbes in sandstorm dust. Potential triggers of allergic and nonallergic respiratory ailments. Allergy 1998;53:255-65. Jarallah JS, al-Rubeaan KA, al-Nuaim AR, al-Ruhaily AA, Kalantan KA. Prevalence and determinants of smoking in three regions of Saudi Arabia. Tob Control 1999;8:53-6.